I may have told some of you before about this place, but when I was in Utrecht a few years ago, my dad showed me a shop front that fasinated me. 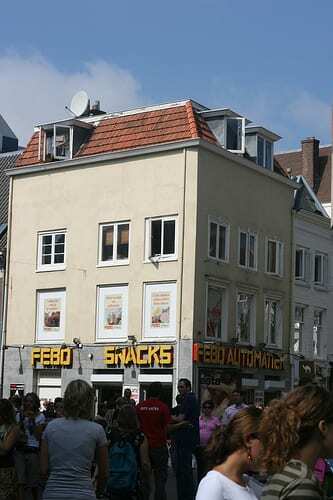 It was a Febo shop, and it was a open front building with walls with little boxes in that were heated. Inside each of these boxes was an item of food, and you dropped in some change into the relevant slot, opened the box and ate your delicious hot thing. (Since my Dutch wasn’t very good, it was quite a lucky dip as to what you got.) My dad and I would have been quite happy to have stayed there all night (it beats Chick o land in Chester anyway!) but my mum wanted to go somewhere else. 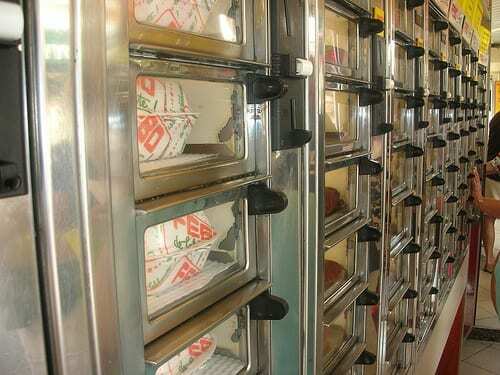 We went again to Utrecht last August, and we were able to go to Febo as much as we liked.Ãƒâ€šÃ‚Â I think we went to four of them in Amsterdam alone.